The WiFi transfer functionality is located in the Services tab of Documents. Tapping that option opens a camera view with instructions to open docstransfer.com on your computer. There, you’ll find a QR code. Scan it, and Documents creates a local WiFi connection between your computer and iOS device. To maintain the connection, Documents must remain open on your iOS device. Once connected, you'll see all the files you have stored in Documents in a tab of your browser. In your browser, you’ll see all the files you have stored in Documents on your iOS device. Drag in files to add them to your iOS device or select one or more files in your browser to download them to your computer. With Chrome, you can also drag whole folders into Documents. The system works with a Mac or PC and over a lightning cable as well as WiFi. In fact, Documents can also transfer files between two iOS devices. In my tests over a couple of days, I found Documents’ WiFi transfer functionality to be fast and reliable. To test the speed of WiFi transfers, I used it to move 16 RAW images from my Mac to my iPhone X, which together were about 250 MB of data. The process took roughly one minute with Documents. I tried the same files with AirDrop too, which was a little faster, but not much. With AirDrop available on iOS devices and Macs, you may wonder what the benefit of Documents’ WiFi transfer is. The primary advantage of Documents, as with so many of its features other features, is flexibility. Unlike AirDrop, Documents can move files over a cable, it works with PCs, and it can handle different file types at the same time. That last point is the one I foresee using Documents for the most. If you try airdropping a collection of mixed file types, the action fails with an error. In the same situation, Documents works like a champ moving any arbitrary collection of files you want. I’ve become a regular user of Files and find it does the trick most of the time, but I’m glad utilities like Documents are available for those occasions when my needs fall outside the mainstream that Apple’s app covers. 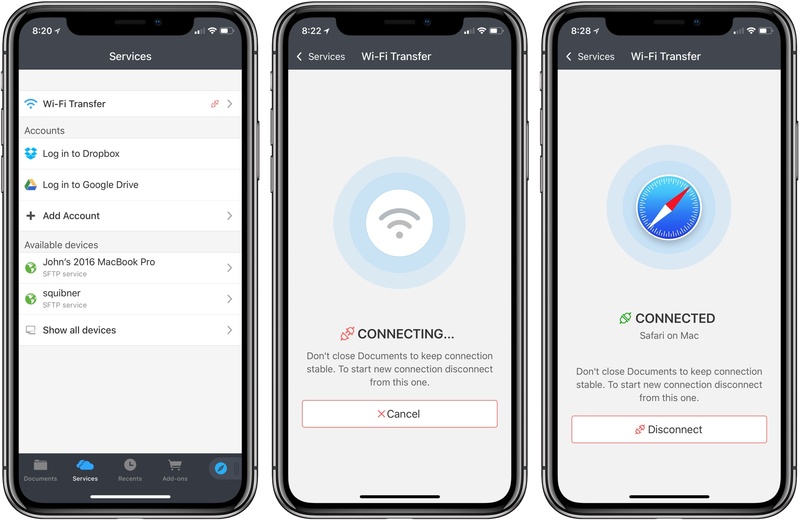 If you’ve ever found yourself frustrated by the process of moving files around on iOS, take a look at Documents’ new WiFi transfer system; it’s very well done. The Documents update, which is scheduled for release today, is available on the App Store as a free download.